Blue on blue, Strings by Aurora look good here! I have noticed coloured strings are becoming a bit of a point of interest with guitar players online lately. I was put onto Strings by Aurora on a guitar forum I frequent, and thought I would contact them to see if they would be interested in reviewing their products. They were kind enough to send me a couple of sets to review, a clear coated silver 10-46 set, and the blue Lite gauge 9-42 strings I’m reviewing here. I installed these strings on my blue Ibanez style custom, and found that they stretched in nice and quickly, and of course looked awesome. Compared to DR Neon strings which feel kind of like cotton, the Aurora coating feels much more metallic and string-like if you get what I mean, Anyone who has tried the DR Neons would probably understand what I’m saying. They probably feel more solid as a result. As many would know, coated strings typically are a bit duller and have less volume than non-coated strings. 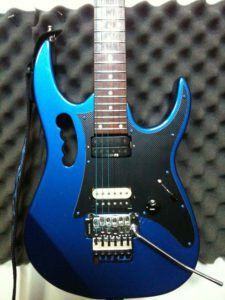 This is due to the coating reducing the pickups abilities to pickup the strings tone. Less magnetism in the strings is the issue. Some coated strings are better then others when it comes to the pickups being able to “pick up” the tone of the string. Strings by Aurora use their own patented enamel coating, and as I mentioned earlier it does feel quite a bit more metallic than others. Tone wise there seems to be only a very minimal drop in volume, and the tone is quite just as bright as many non-coated strings. This is will be a welcomed by many guitars who may shy away from coated, coloured strings. Longevity is going to be an issue for players when it comes to buying coloured strings. It’s a given that the colour is not going to last a long time, and it’s probably going to wear around the pickups where you pick first. 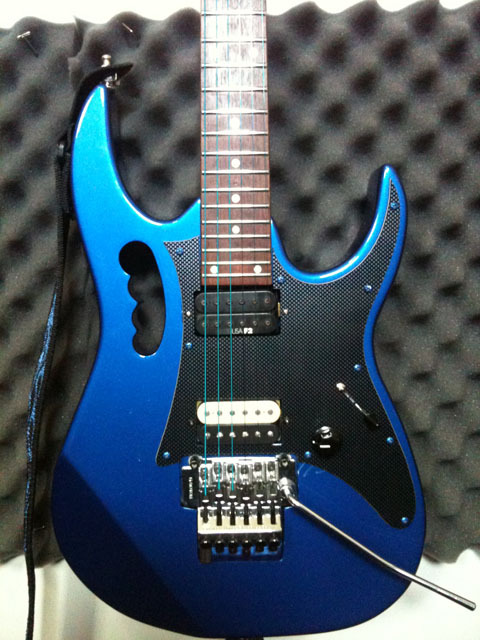 I strung up my blue Ibanez style custom with the Aurora blue strings, where they were played for probably about an hour or so after stringing up, and for a couple of hours at band practice the following evening. I use fairly hard, thick picks, and have a very hard attack for my rhythm playing. This particular band practice was mostly a writing and arranging session which meant I was mostly working on rhythm guitar parts. By the end of the session I had worn the coating off the three lower strings around my pickups. It did hold up for the most part until probably about the last half hour of the session. I feel that this is a pretty good result for these considering my picking attack and pick preference. If you play with a softer pick, and have a less aggressive attack the Aurora strings will probably hold their colour longer. The strings around the fretboard still have a nice vibrant colour, even after many more hours play. The good thing is that once the colour had worn off the tone still remained. They are still bright and vibrant a few weeks after being installed, and I consider that to be the most important thing. Overall the Strings by Aurora Blue Lite gauge 9-42 strings are a great set of strings for the stage. They have a great presence, and probably even more importantly, have tone that holds up against a good set of of non-coated strings. If you don’t have a crazy heavy attack like me the colour will probably hold up for a good long time too.